Copyright �2015 PopEntertainment.com. All rights reserved. Posted: November 5, 2015. "I would like, if I may, to take you on a strange journey." And so it began, in the beautiful Los Angeles City Hall Council Room, with a speech by District 5 Councilman Paul Koretz. He started by calling up the Nuart Theatre Shadowcast Company, Sins Of The Flesh, to do the "Time Warp", introducing the council and all present to the world of The Rocky Horror Picture Show. One of the council members noted, "Oh, we have a naked golden boy here." 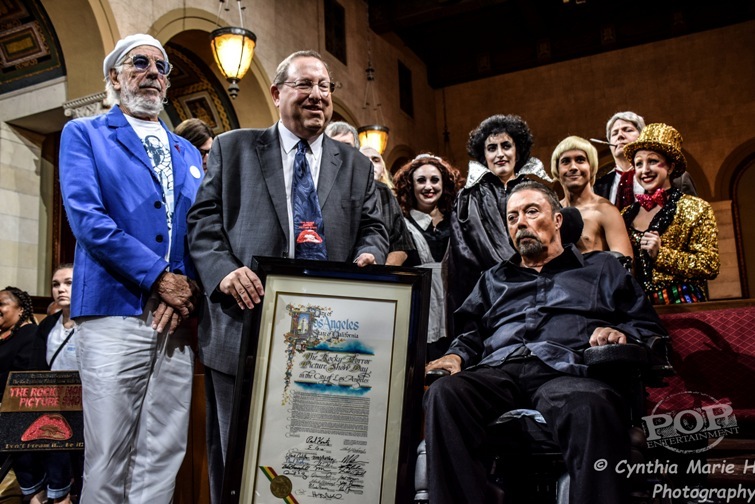 Councilman Koretz, in a Rocky Horror tie, continued on with a heartfelt speech about the U.S. premiere of the movie being shown at the Festival Theatre in Westwood on September 26, 1975. He went on by elaborating on how the small film grew and grew, with audience participation and word of mouth, and that it is "without peer, the longest running film release in history." Of special note, Councilman Koretz also mentioned that "the film has also been helpful and began the bisexual rights movement, the acceptance of fabulous drag queens and has provided an essential community for people who otherwise may feel themselves on the fringe of society." Before he introduced the producer of the movie, Lou Adler, he officially declared October 30, 2015, "The Rocky Horror Picture Show Day." Adler began with saying he grew up in Boyle Heights and "if someone had told me I was going to City Hall this morning I would have been more scared than excited." He said he never would have expected to be celebrating the movie 40 years later. 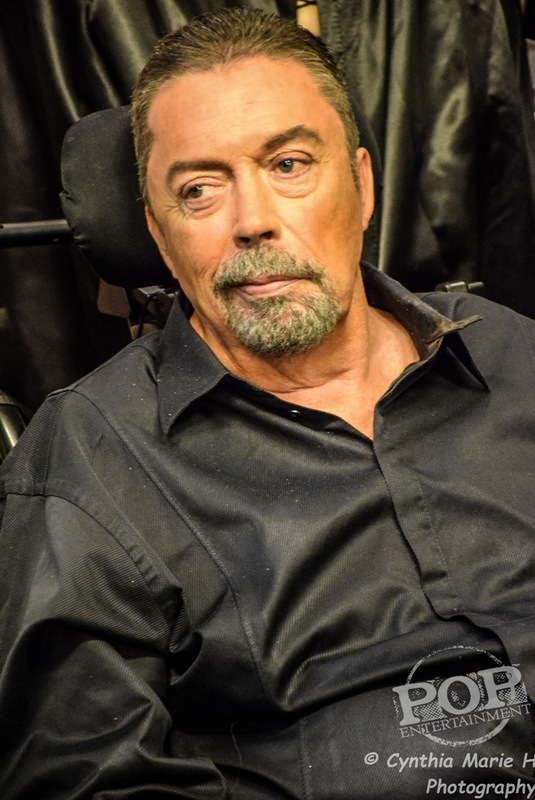 He attributes the entire success of the movie to Tim Curry, saying "to those of us who were disappointed that in 1975 he (Tim) didn't get the Academy Award, he is the reason that this started and has never ended." Tim Curry (who suffered a major stroke in 2012 and is still recovering) was given a microphone and said, "Thank you, councilpersons. This is a great honor. What a beautiful building this, this is.... So close to my favorite American holiday, Halloween." There was a long pause and Marcia Hurwitz, his longtime agent, asked if he had anything more to say, and Curry said, "I don't think so, just thank you. Thank you, thank you." Up next was Sal Piro, The Rocky Horror Picture Show Fan Club founder and President since 1977. Piro was part of the original New York Waverly Theatre audience where all of the audience participation started. He spoke about the fans who have kept this movie alive "week after week, year after year.... We didn't need social media back in 1975. We were our own social media. We were the people who loved the movie so much that we spread the word, and we came, we saw and we conquered." After much applause and a wrap up by Councilman Koretz, we adjourned to a meeting room where we got to take pictures and briefly interview Curry, Adler, Piro and the Shadowcast. Curry was asked what his favorite moment of the movie was and he joked, "When the check cleared." Curry looked for Hurwitz time and time again, and she would occasionally blow kisses at him, which made him smile. Hurwitz told me that her relationship with Curry was wonderful. She had been with him for many years and she was his "person." Curry was asked what he thought the difference was between the play and the movie and he said, "The film is, dare I say it, it is a tiny bit more subtle." About the movie's timelessness, Curry said, "I think it's partly that it was beautifully lit, and beautifully shot. It happened very quickly. We shot it all in eight weeks. It was very exciting for me because it was my first movie." He was also asked what city took the movie to heart the most. "Budapest," he said. "I'm serious. I made a film in Budapest, and the crew came up one by one, practically knelt at my feet.... Film is strictly controlled by the government in Hungary, so they were very excited by Rocky film." Liz Stockton, the Sins of the Flesh's Dr. Frank N. Furter, told me she has now has "been doing this for 25 years, so I've met him before, but this was an honor." Everyone then went to the Festival Theatre, where a plaque was presented, stating "At this site on September 26, 1975 The Rocky Horror Picture Show made its U.S. premiere," with the words "Don't Dream it...Be it!" written across the bottom. 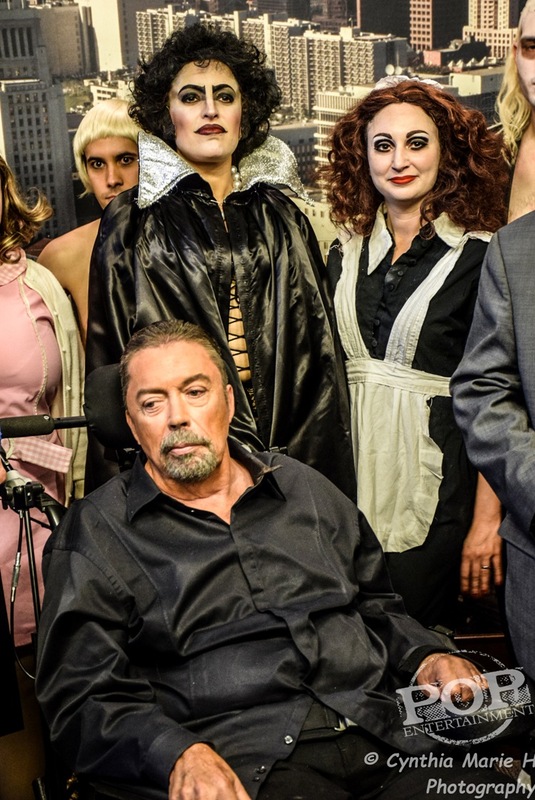 Much the same speeches were made by Councilman Koretz, Piro and Adler, but I did ask Councilman Koretz how The Rocky Horror Picture Show Day came to be. He said he had known Lou Adler many years because he owns the Roxy which is in his district, and they got together and had this idea, so the councilman made it happen. I got to get to ask Curry what his least favorite part of filming the movie was. He said "The pool. It was cold. It took an hour." His most favorite scene was the floor show. And what a floor show it is, even after 40 years! #1 �2015 Cynthia Marie H. All rights reserved. #2 �2015 Cynthia Marie H. All rights reserved. #3 �2015 Cynthia Marie H. All rights reserved.